In a large bowl, combine the water, yeast, honey and olive oil. Mix with a spoon, then let sit until foamy, about 10 minutes. Add in 2 1/2 cups of the flour, the salt, garlic powder and dried basil and oregano, stirring with a spoon until the dough comes together but it still sticky. Using your hands, form the dough into a ball and work the additional 1/2 cup flour (you don’t need to use all if it is not needed) in to the dough, kneading it on a floured surface for a few minutes. Rub the same bowl with olive oil then place the dough inside, turning to coat. Cover with a towel and place in a warm place to rise for about 1 1/2 hours. After the dough has risen, punch it down and place it back on the floured surface. Using a rolling pin, roll it out into a large thin rectangle or oval. Slice the dough into strips. Take each strip and gently “tie” it into a knot, placing it on the baking sheet lined with parchment and repeating with the rest of the dough. Place the towel over the knots and let the baking sheet sit in the warm place for 20 minutes. 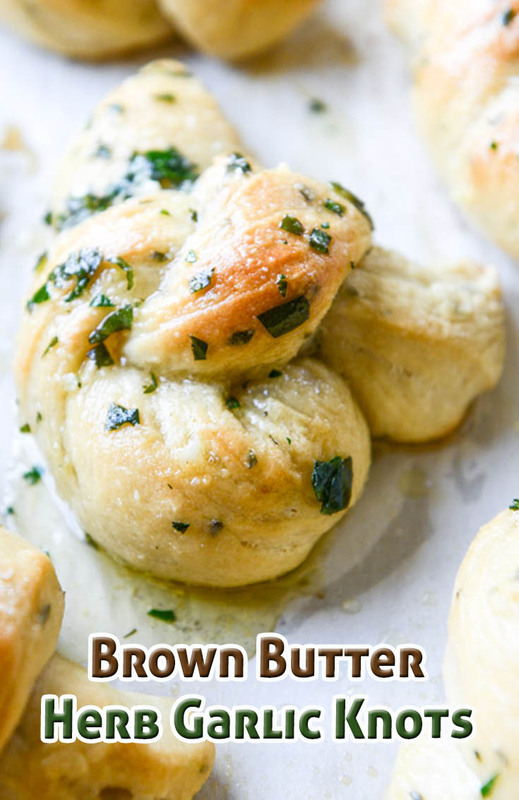 Bake the garlic knots for 20 to 25 minutes, or until golden on top. Remove the sheet from the oven and immediately brush the bread with the brown butter herb mixture. If you want, top with some freshly grated cheese. Serve! Heat a saucepan over medium heat and add the butter. Immediately begin whisking. Stir as it bubbles, and after 2 to 3 minutes or so you should see brown bits appear on the bottom of the pan. Remove from heat immediately and add in the garlic cloves. Continue to whisk for another 30 seconds. Stir in the basil, parsley and oregano.